If the default Joomla! search isn’t enough anymore and you’re looking for an extension that searches content into Joomla! pages and components as well, then you’ll definitely need RSSearch! installed on your website. You can configure RSSearch! to find content in Joomla! articles, sections, categories, in RSMembership!, in RSEvents!, in the Kunena topics and categories. Posted by Mihaela	in RSMembership!, RSEvents!, RSSearch! RSFinder! is a "must have" for Joomla! administrators. It helps you quickly access anything in the backend panel, from articles, menus to Joomla! components. Think of the following situation: you have a website with a significant amount of articles and you want to access a specific article. Instead of going to the “Article Manager” and apply filters to find the article, it's easier to use RSFinder. With RSFinder!, you can now search in backend, for events created with RSEvents!. Just type in the RSFinder! 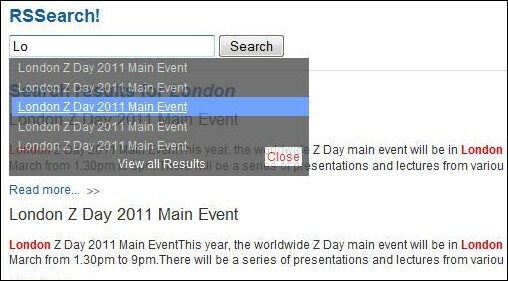 box the first letters of your event and it will automatically display the results. Posted by Mihaela	in RSEvents!, RSFinder!